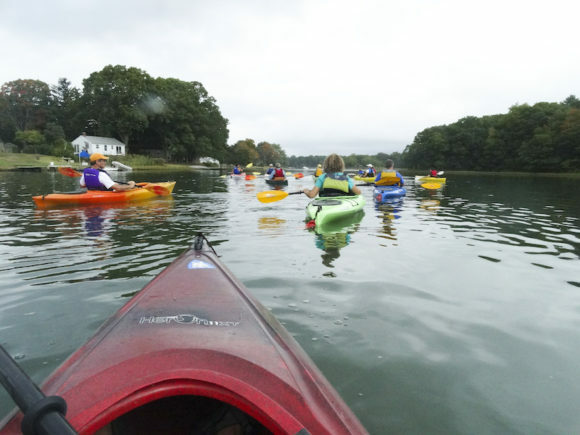 Join the 5th Annual Kayak Regatta hosted by the Old Lyme Land Trust this coming Sunday! All kayakers and canoers are invited to join the 5th annual Old Lyme Land Trust (OLTT) Kayak Regatta. The Regatta will launch at 1 p.m. on Sunday, Sept. 16, from the Pilgrim Landing Boat Launch: CT 156 (Neck Rd.) in Old Lyme to Pilgrim Landing Rd, just past the Old Lyme Marina. The trip will explore the picturesque area around Lord Cove. Leaving from Pilgrim Landing, the tour will enter Lord Cove and paddle past Goose Island to a landing at Whaleback point on the John Lohmann CT River Preserve. There will be a brief visit of the preserve and refreshments provided by the Trust. Landlubbers are welcome at Whaleback point; follow the trail on Coult Lane. A map can be found at www.oldlymelandtrust.org . On the return trip, time permitting, the tour will visit the Trust’s beach on Calves Island. Kayakers can venture further into Lord Cove on a loop through one of the many marsh islands prior to returning to Pilgrim Landing. The event is suitable for families, and will be held rain or shine. Allow 2.5 to 3 hours for the trip. The Regatta will be lead by Fred Fenton, an experienced kayaker and a long time former director of the OLLT. Fenton will point out special features of the area and answer questions about the preserves. No registration is needed and there is no charge for the Regatta. Donations to the OLLT will be gratefully accepted. Personal flotation devices, a.k.a. life jackets, are REQUIRED. For more information, visit www.oldlymelandtrust.org or contact fredfenton16@gmail.com.